the steering brake hub. This hub then rotates with the planetary carrier, and no power is transmitted to the sprocket drive shaft. Occasionally, an adjustment of the steering brake is required to prevent slippage when it is engaged. Consult the manufacturer's service manual for adjustment procedures. The pivot brakes on tracked equipment are of the multiple disc type. Pulling the steering brake levers fully to the rear operates them. The middle discs (splined to the sprocket drive shaft) have laminated linings. The intermediate discs (held in position by studs) are smooth steel discs. An actuating disc assembly is two steel plates with steel balls between them. The assembly is located in the center of the discs and is connected to the operating linkage. Ramps are machined on the steel plate of the actuating disc assembly, so when the brakes are applied, the steel balls move up the ramps and force the plates apart. Movement of the plates causes the discs to be squeezed together and to stop rotation of the sprocket drive shaft. When these brakes are fully applied, the tracks will stop. The steering levers are linked to the brakes independently to actuate them for sharp turns. Adjustment of the pivot brakes is required to provide adequate braking with the steering levers. An adjustment is required when the steering levers can be pulled against the seat with the engine running. Consult the manufacturer's service manual for proper adjustment procedures. The hydrostatic drive is an automatic fluid drive that uses fluid under pressure to transmit engine power to the drive wheels or tracks. Mechanical power from the engine is converted to hydraulic power by a pump-motor team. This power is then converted back to mechanical power for the drive wheels or tracks. The pump-motor team is the heart of the hydrostatic drive system. Basically, the pump and motor are joined in a closed hydraulic loop; the return line from the motor is joined directly to the intake of the pump, rather than to the reservoir (fig. 6-11). 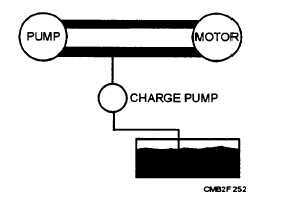 A charge pump maintains system pressure, using supply oil from the reservoir. The hydrostatic drive functions as both a clutch and transmission. The final gear train then can be simplified with the hydrostatic unit supplying infinite speed and torque ranges as well as reverses speeds. Liquids have no shape of their own. 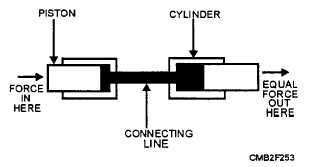 Two cylinders connected by a line both filled with oil. Each cylinder contains a piston. When a force is applied to one of the pistons, the piston moves against the oil. Since the oil will not compress, it acts as a solid connection and moves the other piston. In a hydrostatic drive, several pistons are used to transmit power - one group in the PUMP sending power to another group. in the MOTOR. The pistons are in a cylinder block and revolve around a shaft. The pistons also move in and out of the block parallel to the shaft. Figure 6-11. - Pump and motor form a closed hydraulic loop. Figure 6-12. - Basic hydrostatic principle.